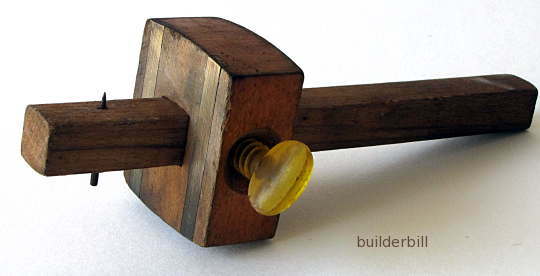 In woodworking: A hand tool made out of mainly wood to mark or score lines parallel to an edge or face. The gauge is used for making a single line parallel to an edge, but it does a lot more than simply that. It can be used to find the center of the width of a piece of timber, by trial and error marking gently from each face until until the two marks are the same. 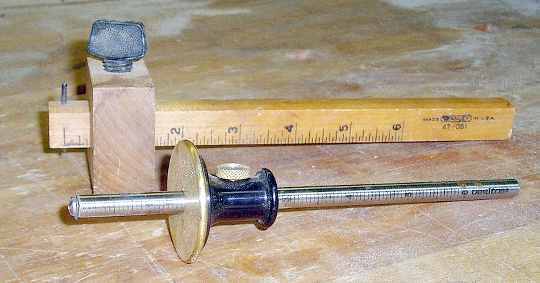 An example of this is using it to find the center of a door edge for drilling lock holes. Often misunderstood by people who prefer to use pencil marks is the fact that a quite deep gauge mark can be used as a positive way of locating a chisel for cutting. An example is the use of a gauge to mark hinge recesses when hanging doors. In use the approximate position is set and the thumbscrew is nipped up just enough to grip. Fine adjustments are made by lightly tapping either the top or bottom of the beam on a hard object. When the setting is correct the the screw is tightened firmly. These gauges are often used for making quite deep "Vee" shaped grooves. An example is a quirk on the stile of a double door where the two leaves are rebated together. A good deep gauge line is made at the edge of the style. Then a sharp rebate plane is used to take a fine shaving off each side of the gauged line. This is repeated until the required depth is needed. A wooden and a steel marking gauge. The metal gauge above is a variation on a theme. The idea is (I think) that it is supposed to be more versatile and easier to use than the old wooden ones. I've held one in a store and not been overly impressed. Just couldn't see any advantage in it myself. Sure it won't dry out and shrink and it will not wear as much but I still prefer the feel of wood.